Elbit Systems claimed these artillery pieces are cost-effective and require small crews. Based on this description, ATMOS 155mm truck howitzers (pictured above) are soon being adopted by the Israel Defense Force (IDF). Truck howitzers enjoy a fair amount of prestige across the Middle East. The South African G6 is in service with the militaries of Jordan and the UAE while the French Caesar has been delivered to Saudi Arabia and the French army’s contribution to the fight against the Islamic State saw its constant use. Both Egypt and Iran managed to assemble their own truck howitzers and the Syrian Civil War is one theater where all sorts of Soviet artillery are mounted on trucks. But Elbit Systems has a rightful boast to possessing the know-how for a high tech “automatic howitzer” based on the 155mm Soltam developed back in the 1960s. A bigger export success rather than a favorite of the IDF, the Soltam was sold to a dozen countries and later rebranded the ATHOS with a mechatronic arm for loading fresh rounds into the breech. The ATHOS on a 6×6 and 8×8 chassis is known as the ATMOS, which enjoyed robust demand in Southeast Asia where the armies of Thailand and the Philippines have bought whole batteries. 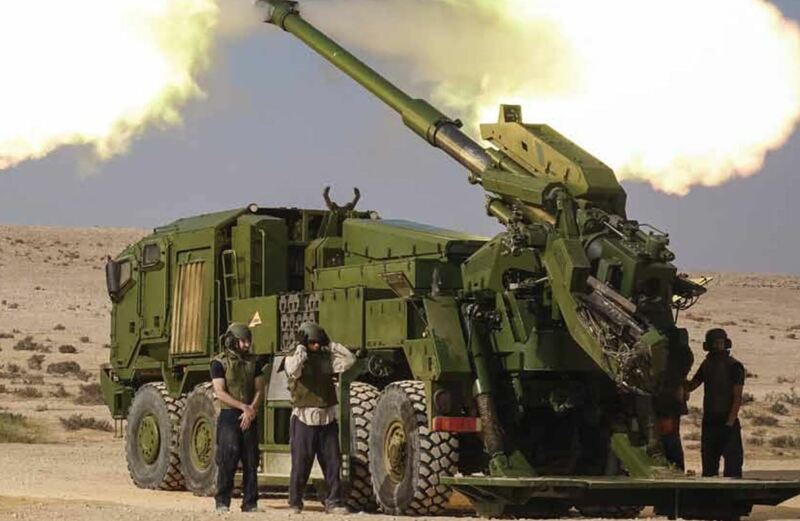 A $125 million contract for ATMOS truck howitzers looks like only a small batch was ordered by the defense ministry since contemporaneous artillery pieces today can cost almost as much as a third-generation main battle tank or MBT. But the timing is fortunate now that age is catching up to the IDF’s 155mm M109 self-propelled howitzers. Israel’s army are believed to operate 250 US-made M109A6 SPHs with hundreds more kept in storage together with older M-50/L-33, M107, and M110 howitzers. Although renowned for their dependability and ruggedness (nearly two thousand M109’s are spread across the Middle East, including Iran), the M109-series are now deemed out-ranged by a newer generation of self-propelled guns from China and Russia. It’s unclear if the IDF want the ATMOS in 6×6 or 8×8 configuration or how many are to be acquired in the next decade. Either way, the advantage of the ATMOS is its ability to coordinate with drones and launch precision rounds at a target. The IDF’s air power might be a fixture in world news, but simmering border disputes and the threat posed by terrorists setting up positions for mortar and rocket attacks demand a powerful deterrent on the ground. From the IDF’s invasion of Lebanon in 1982 until the present stalemate with Hamas in the Gaza Strip, artillery always played a vital role supporting Israel’s hard-pressed infantry.